Pacific White Sided Dolphins are sociable marine mammals who need very little encouragement to wake or bow ride near boats. Found in the Pacific Ocean, these dolphins are often nicknamed lags because of their long scientific name: Lagenorhynchus obliquidens. 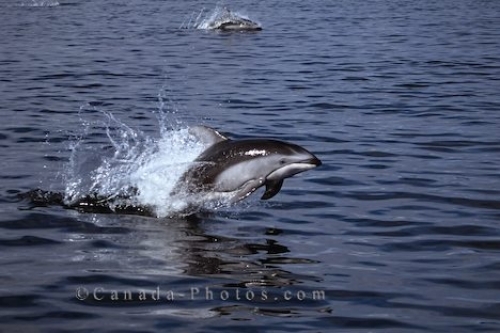 Picture of speeding Pacific White Sided Dolphins playing in the waters off British Columbia.